Think hockey players are all brawn and no brains? Well, think again. There are many players who not only possess incredible hockey skills, allowing them to make a great pass or anticipate an upcoming play, but also have the book smarts to be equally creative off the ice. Find out whose academic scores are off the charts and what makes each player so darn smart. He's one of hockey's most respected pugilists, but in reality, George Parros is more of an egghead than a knucklehead. The Anaheim Ducks winger unofficially leads the NHL with 23 fights as of March 1, however, he'd just as soon give someone the business off the ice. An economics major at Princeton University, Parros believes if he wasn't a professional hockey player he'd be a business consultant or a stock trader. He also scored a 1250 on his SATs and is an avid crossword junkie. Standing six foot seven, Montreal Canadiens blue-liner Hal Gill is one of the biggest players to ever play the game. Throw in the fact that he's known for his defensive skills, thanks to his incredible wingspan, and it is not hard to see why Gill has had such a long and successful career. But aside from his defensive prowess and occasionally mixing it up, Gill prefers to use his intelligence to earn him an advantage. The hulking defenceman has a degree in mathematics from Providence College, which gives him the edge when trying to angle off an oncoming attacker. As impressive as it is for Hal Gill to have a degree in mathematics, Edmonton Oilers centre Shawn Horcoff has one-upped him. Horcoff studied math and finance at Michigan State University, receiving his degree in 2000, while starring for the Spartans. It's all those smarts that probably played into management's decision to name the Trail, B.C. native the 13th captain in team history last October. Dominic Moore has made a name for himself as a gritty, effective two-way forward who is willing to do anything for his teammates. Now with the Tampa Bay Lightning, Moore has been a key player on the Southeast Division-leading team by using his hockey smarts in important situations. He must have picked that up at Harvard University. Moore graduated in 2003 after leading the Crimson to two NCAA titles. He even got to play with his brothers Mark and Steve in 1999-2000. In only his second season with the New York Islanders, winger Matt Moulson has turned into quite the prolific goal scorer. In his first full NHL season in 2009-10, Moulson netted 30 goals and has followed that up nicely by already notching 30 through March 29th this year. But the Mississauga, Ont. native wasn't always a known commodity. He got his start at Cornell University, where he was team captain and eventually earned his degree in 2006. Just prior to George Parros's tenure at Princeton University, another current player donned the Tigers' colours. The Montreal Canadiens' Jeff Halpern– known as a quick, gritty centre – earned an economics degree after graduating in 1999. After successfully rehabbing and returning from the after-effects of a knee injury in the last couple of seasons, Halpern is back to his former self with 23 points in 61 games this season. A relentless forechecker and an excellent penalty killer, Philadelphia Flyers winger Darroll Powe is the type of player any contending team needs in order to challenge for the Stanley Cup. Powe has the ability to make intelligent, sound decisions by studying the tendencies of his opponents – assets that could play a role in a long playoff run for the Flyers this spring. The Saskatoon, Saskatchewan native has a degree in sociology at Princeton University and was captain of his team in his senior year. Craig Adams is a valuable asset wherever he plays. He has used his skills in the face-off circle and on the penalty kill to be a key contributor to two Stanley Cup-winning teams – the 2006 Carolina Hurricanes and 2009 Pittsburgh Penguins. Combined with this, Craig also possess a physical side to his game, taking the lead on the forecheck and is certainly not adverse to mixing it up. Originally selected by the Hartford Whalers 223rd overall in 1996 while attending Harvard University, Adams eventually graduated from the Ivy League school in 1999. Kevin Westgarth is one of hockey's toughest customers. Anoyone who follows the Kings or has laced up the blades against Kevin can vouch for that. He is a player that understands his role with the Kings and is effective at doing his job. Judging by his 11 fighting majors in 43 games with the Los Angeles Kings, Westgarth is quite adept at standing up for his teammates, in all situations. Along with his tough-guy abilities though, Kevin is one of the the more academic players away from the rink, having graduated from Princeton University in 2007. Vancouver Canucks winger Tanner Glass is known for his ability to dish out big hits on the forecheck, as well as contribute offensively from time to time, currently sitting with 10 points in 64 games on a very deep Vancouver team. But Glass is as smart as he is tough. A graduate of the Ivy League's Dartmouth College in 2007, it was recently reported that Glass accepted a challenge from a team blogger to play a game of Scrabble for charity. The game raised nearly $9,000 for the Canucks For Kids Fund. It looks like Mathieu Darche has made it big. Since joining the professional ranks in 2000, the St. Laurent, Que. native has played in 86 NHL games as a member of four different teams. He now seems to have found a solid spot, coincidentally, back at home. The left-winger is back in Montreal – where he once starred with the McGill Redmen – and has 21 points in this his second season with the Canadiens. While at McGill, Darche managed to tally an impressive 62 points in just 26 games during his final season. But for all his success on the ice, he performed just as well in the classroom. There, Darche earned a commence degree in marketing and international business. When Joel Ward wasn't drafted out of the Ontario Hockey League, he had to adjust his approach to fulfilling his professional hockey dreams. Knowing this, the North York, Ont. 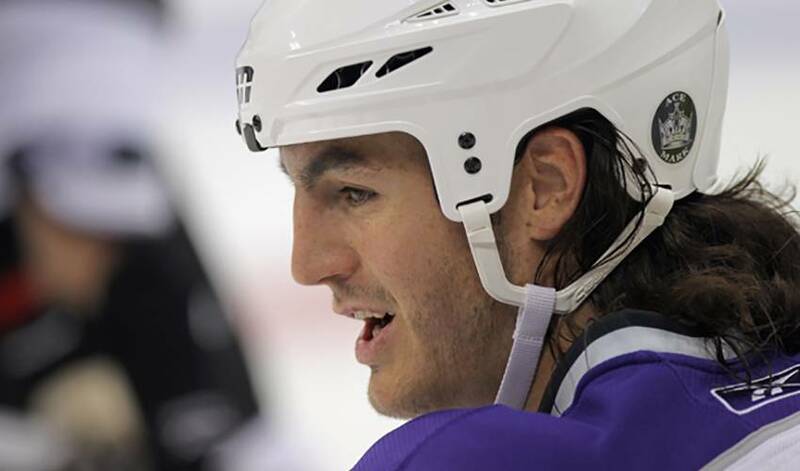 native went to the University of Prince Edward Island, earned his sociology degree, and was a standout on the ice. He was the Panthers' rookie of the year and then followed that up with three consecutive team MVP awards, averaging over a point per game in every season on the Island. After getting his feet wet with the Minnesota Wild, the right-winger has been an important cog in the Predators' wheel in the past three seasons.